Our goal at The Dinner Daily is to make dinners as easy as possible, which is why we provide weekly menus that are customized to each member’s food preferences and dietary needs and which use the weekly specials at their store. We provide you with a ready-to-go plan; we do the work so you don’t have to! But we also know that you want to have control over your menu and sometimes are looking for just the right recipe. So we are super pleased to have released our new Search All Recipes feature which lets our members search our entire recipe database for main dish recipes to add to their weekly menu. This has been one of our members’ most frequent new feature request. If one of the search results looks good – just click on it and your menu and shopping list will be updated. Or you can change your search term and try again! Of course you can always revert back to your original menu by clicking the “Restore Original Menu” link at the top of your menu as well. 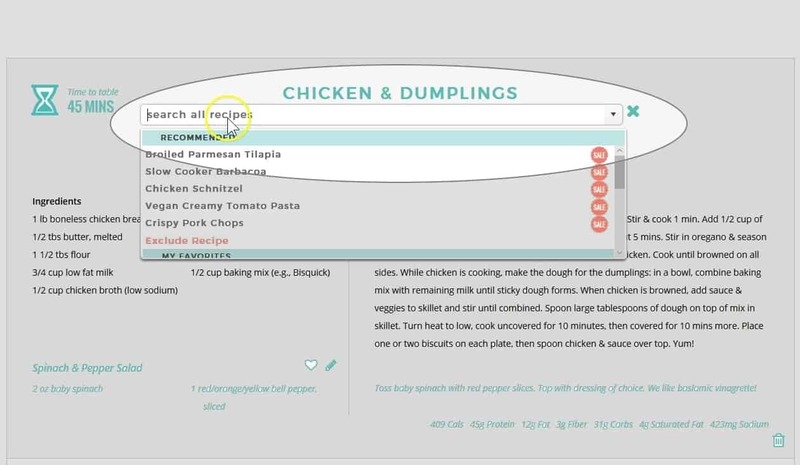 Here’s a quick video we created to show you how easy the new search all recipes feature is to use. Give it a try and tell us what you think in the comments section below. Or if you aren’t a Dinner Daily member yet, learn more about it! I check the menu when it comes out I am only able to see alternatives for the sides, not the main dishes which is frustrating. Why is that? Hi Rosanne, you should absolutely be able to see alternatives for your main courses and we just checked your menus and found alternatives for all dishes. Our support team will be getting in touch with you shortly. Hi Kimberley, the link to our short Search All Recipes demo video is: https://thedinnerdaily.com/how-to-search-all-recipes/ That should explain exactly how it works!